On Aug. 1, researchers at Scripps Institution of Oceanography at the University of California San Diego logged the warmest sea-surface temperature at the Ellen Browning Scripps Memorial Pier since records began in August 1916. 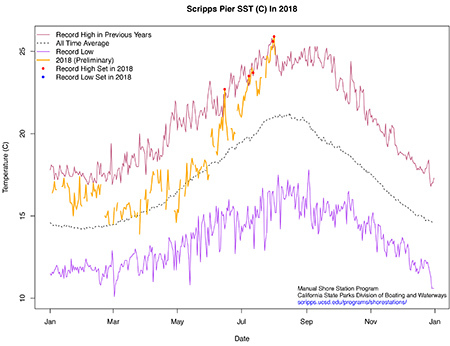 The record of 25.9℃ (78.6℉) followed a string of days in which individual daily records of sea-surface and seafloor temperatures had been set at the pier. It surpassed the previous record of 78.4°F (25.8°C) set on July 30, 1931 during an unusually warm period that year. Scripps researchers have taken sea-surface temperature and salinity readings at the pier since 1916. In 1925, they began taking seafloor water temperature measurements as well. The daily collection of data is still done by hand and is maintained by the Shore Stations program at Scripps. 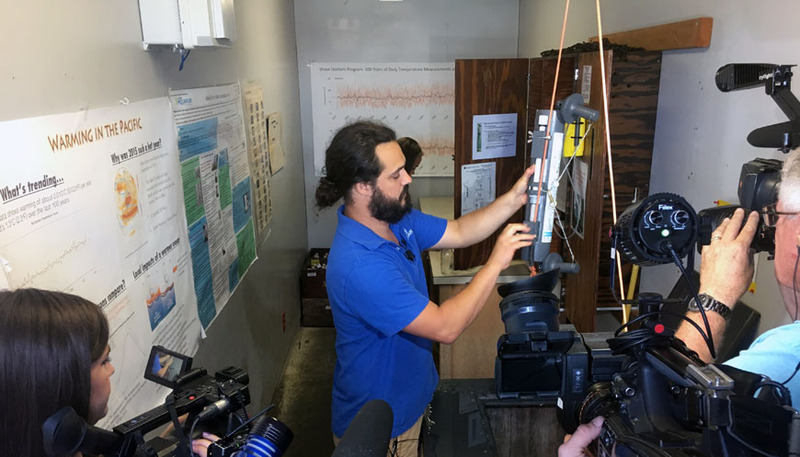 The program now includes nine stations on the California coast that measure seawater temperature and salinity, its budget funded by the California State Parks Department of Boating and Waterways. In addition to the manual measurements taken daily, the Shore Stations Program also maintains continuous automated measurements of temperature, salinity, chlorophyll and pressure at the pier as part of the Southern California Coastal Ocean Observing System. Physical oceanographer Dan Rudnick administers a Scripps program that employs gliders to make ocean temperature profiles to points nearly 100 miles off the California coast as well as in other regions around the world. He has noticed a similar warming throughout the current that travels along the coast in recent years though no records have been broken so far. Rudnick is one of several Scripps researchers who has tracked an uptick in ocean temperatures related to El Niño, a phenomenon characterized by the movement of warm waters to the eastern equatorial Pacific Ocean, which often affects water temperatures off California. The rise began in 2014, just before an intense El Niño bore down on the West Coast the following year. In times past, the pattern would have been for ocean water temperatures to return to historical averages following the event but that hasn’t been the case. The Coastal Data Information Program (CDIP) also tracks sea-surface temperature through a network of wave-measuring buoys deployed throughout U.S. waters, including 14 in Southern California. Near-record high temperature readings for this time of year have been recorded across the Southern California array during the past few weeks. The Scripps Nearshore Buoy, located approximately a half-mile off the coast of La Jolla, recorded its second highest sea-surface temperature of 79.7 degrees on Aug. 1, second only to a reading from Sept. 2015, an El Niño year.